TASK: Implement initial reconnaissance. Evaluate. Astrophysics Immune to Thine Own Self. If present when your Adapt: Negate Obstruction is nullified, you may place it beneath draw deck. 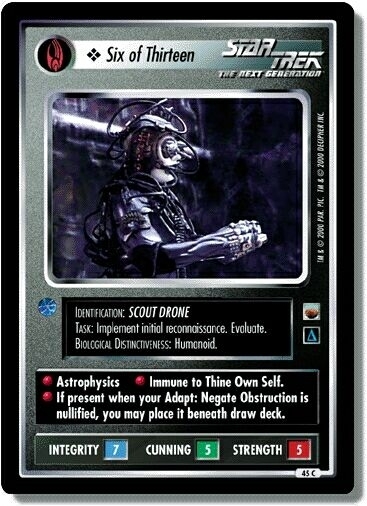 Characteristics: "Continuing Mission"-related cards, affiliation, Drone, Borg species. There are 15 entries for Six of Thirteen (ST1E 9 C 45) at the Tradeplace (53 haves and 0 wants). Click here to see all trade list entries for this Common card!